In 2003, Touch and Go (TaG) engines were welcomed to the SuperNationals event with a Masters division, opening up with 15 competitors at the Rio. Michael Brookes was the inaugural winner and was able to repeat the following year for the first edition at the Sam Boyd Stadium location. Since then, three others have earned multiple wins in the category, now labeled the X30 Master division with the move to the IAME powerplant. For years, the category reached the 44-driver cap for entries early as the first class to sell out once registration opened to public. Superkarts! USA expanded the category past the 44-mark for 2016, with 53 drivers set to compete for a spot on the SuperSunday grid. The X30 Master division has the most former SuperNationals winners returning in the same category with five drivers on the entry list accounting for eight of the 13 victories. Last year’s winner Kip Foster is looking for a third straight. The Aussie had two provisional victories taken away in 2010 and 2011 for technical infractions, and finally reached the top step of the podium to close out the Rio in 2014. Last year, Foster was shuffled back early, but climbed his way to the front toward the end of the main event, securing a second straight victory. Foster is back with KartSport North America aboard the winning Arrow machine. In the six-year history of the SKUSA Pro Tour, five drivers have scored the series title. Defending champion Nick Tucker is still mathematically alive heading into the SuperNationals, however, the 194-point deficit is something no other driver has been able to overcome in previous seasons. A perfect four-days of official competition in Las Vegas is needed along with some help for the now Fullerton-USA driver carrying the SKUSA #1 plate. The odds for the title are in the favor of Derek Wang. Not yet a winner on the SKUSA Pro Tour, Wang (BBR / FA Kart) was consistent through the SpringNationals and SummerNationals to establish a 95-point advantage heading into the SuperNationals. Wang already has a national title on his record for 2016 winning the Masters Max title in August, placing 12th at the world championship in DD2 Masters. Erik Jackson is the lead challenger, thanks to a victory at the SummerNationals. It was the first for Jackson and the MMK operation and chassis on the Pro Tour. Jackson finished third at last year’s SuperNationals as the top finishing American, needing another run to the podium to help secure the Pro Tour title. 2005 SuperNationals winner John Crow is the third driver involved in the title chase. Crow is making his first SuperNats start in the X30 Master category since 2011 where he finished 15th, and switching to the CompKart chassis for Las Vegas. Racing in the S4 Super Master division as well, the California driver will need some ‘Double-Double’ to fuel the busy five days of on-track action. Each and every year, the X30 Master entry list features a number of possible picks to be the race winner on SuperSunday. No one has more wins in the category than Leonardo Nienkotter. The Brazilian won from 2010 to 2012, missing out on a record-tying fourth SuperNationals victory in 2013 and 2014. After missing last year’s event, Nienkotter is back with J3 Competition aboard a CompKart in search of making history. Jim Russell Jr. and Travis Irving round out the previous winners list competing in 2016. Russell took the victory in 2013 and has a runner-up finish from 2011. His Russell Karting Specialties / Parolin package has proven to be fast every time out, coming from the tail of the field to finish runner-up Sunday at the SpringNationals after replacing Scott Falcone. Irving won way back in 2006 when the class welcomed drivers under the age limit who met the minimum driver weight. 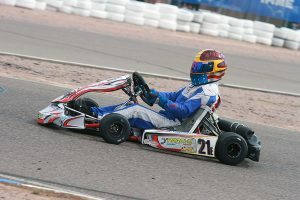 Now among the ‘more experienced drivers’ age criteria, Irving (CompKart) has come back after being away from the sport, set to make his homecoming to the SuperNationals since that victory. The 2016 SKUSA Pro Tour featured four different winners on the season. In addition to Jackson, Eduardo Dieter and Mario Barrios will look for a second victory on the year. Dieter has been a contender at the SuperNationals for the past two seasons, placing inside the top-10 both years with a third in 2014 as his best result. 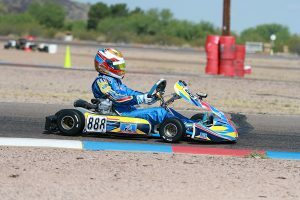 The SpringNationals race winner is on the Italkart, a brand that has been successful at the SuperNats many times before, but never in the Master division. Dieter could change that. Barrios came from no where to become the dominant driver Sunday at the SummerNationals aboard his BBR / Gillard. It was his second Pro Tour podium finish after earning a spot on last year’s SpringNationals steps. Franklin Motorsports’ Jamie Sieracki is electing to sit out as a driver at this year’s SuperNationals to focus on getting the rest of Merlin Nation to the top of the podium on SuperSunday. In addition to Tucker, two other former series champions are in the field for this SuperNationals. 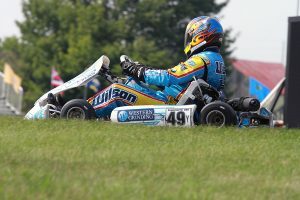 Ethan Wilson is a two-time SKUSA Pro Tour champion (2010, 2014) and is set to make his eighth straight SuperNats start – most by anyone in the category. 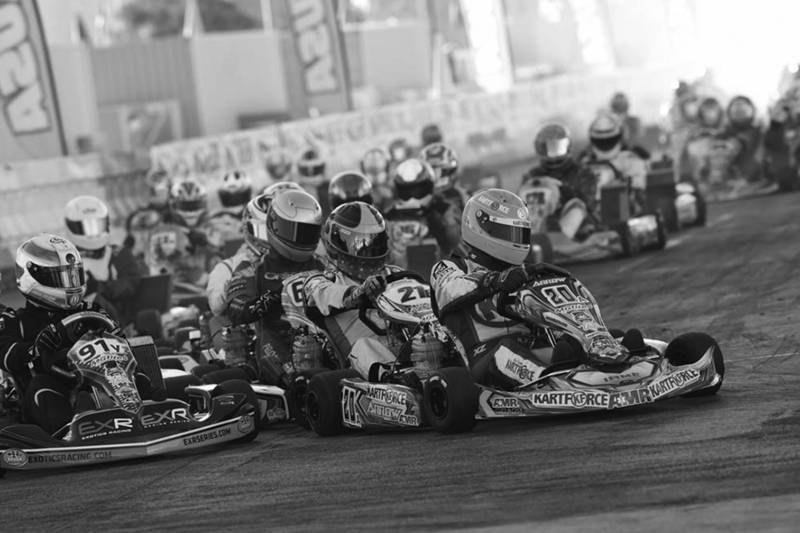 The PGR / Tony Kart driver had a possible victory taken away in 2013, and continues to return for redemption. 2013 champ Scott Falcone goes ‘all in’ for the SuperNationals every year. The year he won the championship, he watched the final laps from the sidelines due to an incident after fighting hard for the lead against a stacked field. 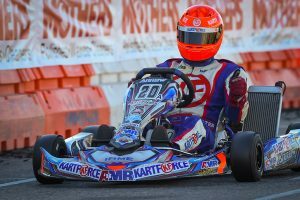 Falcone has bounced around this season, and is back with the KartSport North America squad aboard the familiar Arrow machine that he won his title with. Some wildcards to watch include Diego Pelosi (RPM / Tony Kart), who has three top-seven finishes in the last three years, including runner-up a year ago. Tim Meyer (Intrepid) scored three runner-up finishes at the California ProKart Challenge program to open up the season, looking for his first non-DNF finish at the SuperNationals.